It seems that almost daily someone writes on one of the Facebook genealogy sites, "Why don't I match the person that my relative does?" 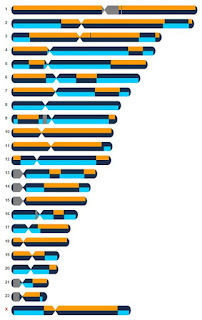 We have the stock answers that include autosomal DNA is inherited in a random manner. Rarely have I seen this so vividly illustrated as in the results of two of my grandsons. In earlier posts the last several days, I have pointed out that each of them inherited different amounts as well as different segments from each of their four grandparents. If this much variation can occur in just two generations, it can really be skewed as it is compounded over four or five generation. The first of my three previous posts on this subject demonstrated that grandchildren do not inherit equal amounts of atDNA from each grandparent although it appears that each set of grandparents contribute 50%. To review this post click here. In a follow-up post I demonstrated that these variances of amounts of atDNA inherited by grandchild can alter ethnic predictions between full siblings. To review this post click here. 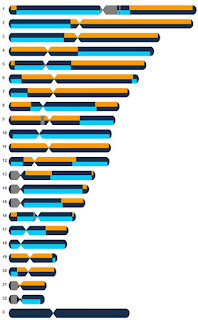 In yesterday's post I used Family Finder's chromosome browser tool to illustrate how each segment larger than 5 cM of DNA was inherited by each of my grandsons from each set of their grandparents. To review this post click here. After my post yesterday, Ann Turner asked if I would be willing to do more analysis on the matching segments the two of my grandsons inherited from their four grandparents by dropping the threshold from 5 cM down to 1 cM. In preparing the data to send to Ann for her analysis, I noticed that the two grandsons had vastly different numbers of matches on Family Finder. One had 23% more than his brother. These numbers were not trivial. One had almost a thousand more than the other. How could this be if they were really full siblings? It largely depends on who is in the database. 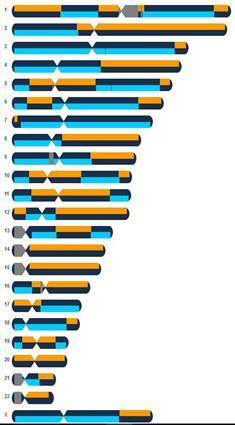 Groups from different parts of the world are unevenly represented in various DNA databases. The FTDNA database has a disproportionally heavy presence of Ashkenazi Jews. The maternal grandfather shown below has a high percentage of Ashkenazi ancestry. FTDNA has been able to identify about 90% of his atDNA as being of Ashkenazi origin. His number of matches in the database far exceed the number of matches reported from any of the other three grandparents. Conclusion: the grandson who inherited the most DNA from his paternal grandfather will have the most matches in this database. 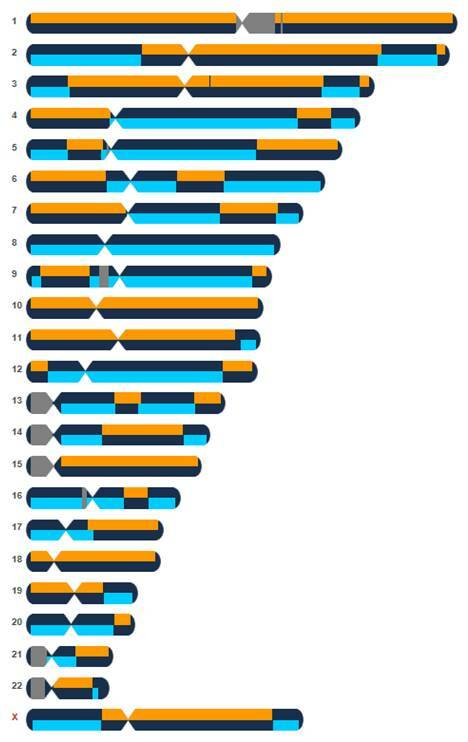 Grandson #1 below only inherited 22.1% of his atDNA from his maternal (Ashkenazi) grandfather. Statistically normal would be 25%. He did dip into the treasure trove of Ashkenazi results in the database. 18% of his DNA is shown to be of Ashkenazi origins. However, he did not inherit DNA of that origin to the extent his brother did. This grandson inherited 28% of his DNA from his maternal grandmother whose ancestors came from areas of Central Europe that are underrepresented in this database. She currently has less than 400 matches. So the combination of the DNA he inherited from his grandmother (along with her scant matches) and did not inherit from his grandfather was largely responsible for him having over 900 fewer matches than his brother. 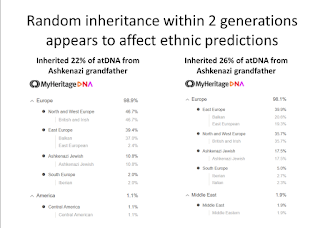 Grandson #2 inherited 26.2% of his atDNA from his Ashkenazi grandfather. That may not sound like a big difference. However it is approximately a 19% increase from the amount inherited by grandson #1. 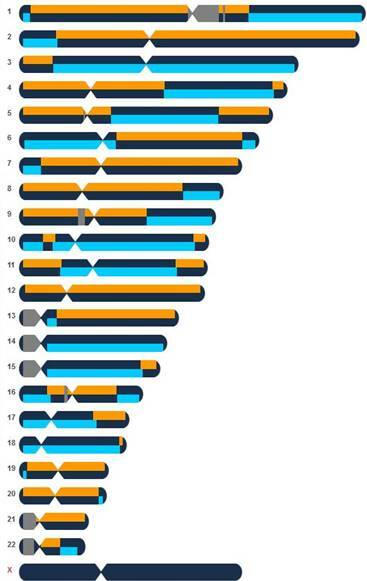 Even though the maternal grandfather seems to have won the lottery with more than ten thousand DNA matches, his pedigree chart is so short that we cannot yet begin to sort any of those matches into paternal and maternal ancestors. The paternal grandmother has an extensive pedigree chart; but as yet she has not added it to her Family Finder account. The mother (my daughter-in-law) seems to have the number of matches that is near the average of her Ashkenazi father and her match deprived mother. The father (my son) also seems to have the number of matches that is about the average of his parents. Why do you have the number of autosomal matches that you do? Predictions of our ethnic origins are one of the biggest draws to get people to order a DNA testing kit. Almost all of these predictions are based on our autosomal DNA. That's the only DNA tested by Ancestry, 23andMe and MyHeritage. 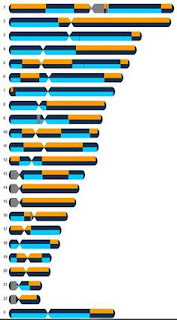 Family Tree DNA offers these predictions as part of its Family Finder test results. Marketing surveys suggest that more more than half of millennials who take genealogy DNA tests are doing it only or primarily to find out whether they should be wearing kilts or lederhosen to the next family gathering. 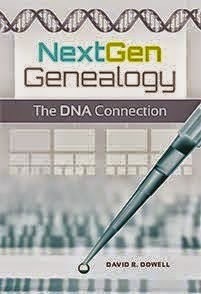 In spite of the warnings of prominent genetic genealogists that these projections at present are one of the softest parts of the science of genetic genealogy, the advertising seen on television and elsewhere continues to emphasize predictions of ethnic origins. It just doesn’t seem to matter. You can’t rely on DNA tests to give you exact percentages of your ethnic origins beyond the continental level (European, versus African, versus Asian). Inheritance of our atDNA is random. We all know that we inherited 50% of our atDNA from our fathers and 50% from our mothers. But how many of us know how much of our atDNA we inherited from our maternal grandfather? Would this make a difference in our predicted ethnicity? Of course it would. Last month I published results from atDNA tests taken by two of my grandsons at MyHeritage. They are full siblings. Their other grandfather is primarily Ashkenazi. His Family Finder origins prediction is shown below. None of the other three grandparents show the presence of any Ashkenazi genetic component in their Family Finder results. 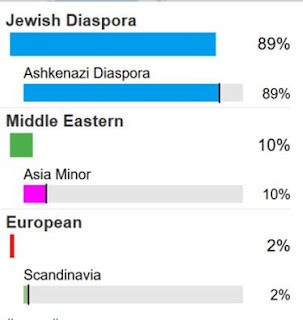 My daughter-in-law was reported in her Family Finder results to be 42% Ashkenazi. [23andMe reported 48%.] Although I am not comparing apples to oranges in this post, I may be comparing different varieties of apples to each other by comparing testing results from three different companies. However, different family members have tested at different companies. These cross testing companies comparisons should not effect my main point in this post. If you have data that would dispute that, please share and we all will learn something. 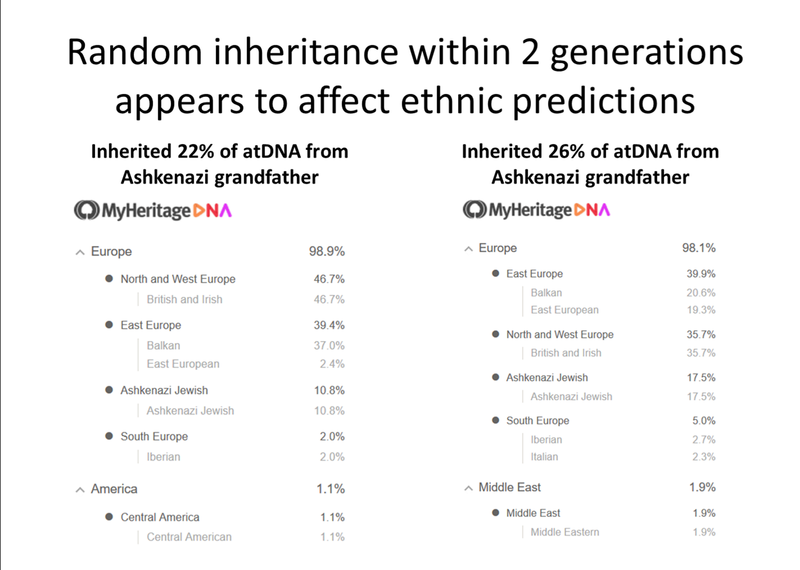 My main point is that my grandson who appeared to inherit only 22% of his atDNA from his Ashkenazi grandfather in my previous post, was shown by Family Finder to have significantly less Ashkenazi ethnicity than did his full sibling who appears to have inherited 26% of his atDNA from that grandfather. This is an extremely small sample and the results may be distorted because results from different companies are being compared. 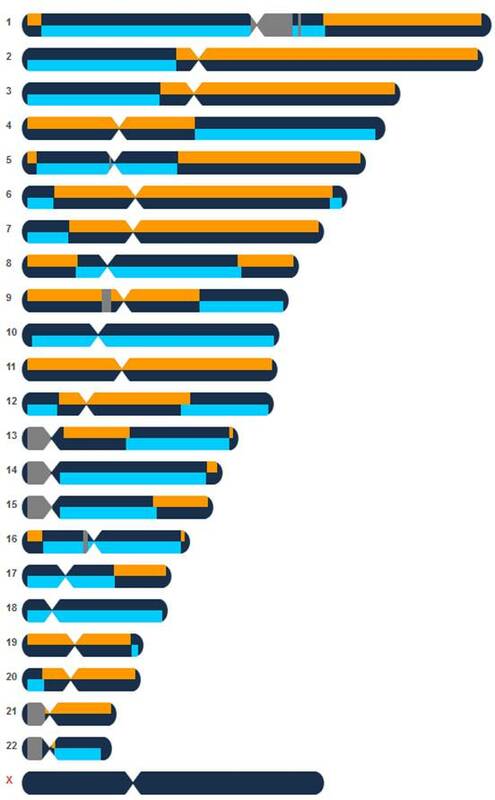 However, I encourage you to try this at home if you have test results reflecting the difference between the atDNA inheritance patterns of sibling grandchildren. The result I report above is in accordance with what common sense would lead me to believe. If you have results that would support or refute this tentative hypothesis, I would love to see it. Maybe we all will learn something.